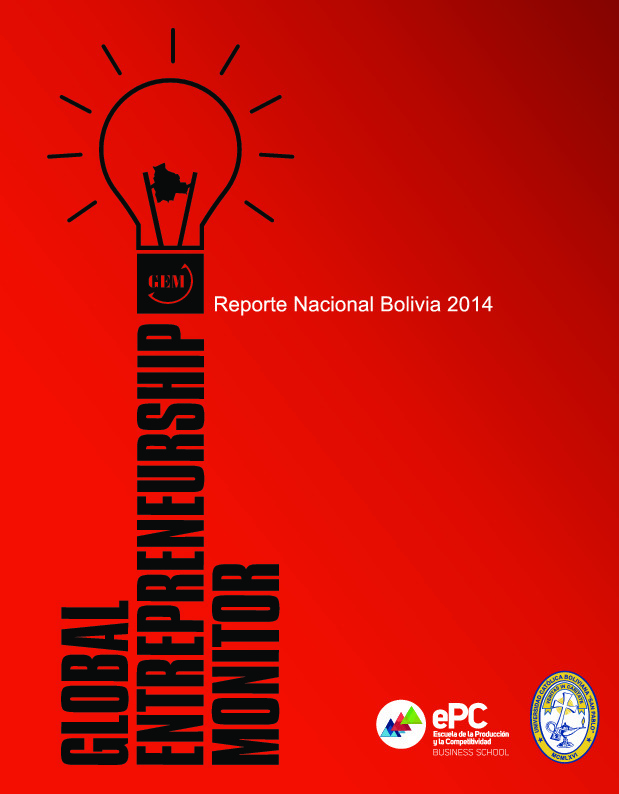 Bolivia had the sixth highest TEA (Total early-stage Entrepreneurial Activity) rate among GEM participating countries in 2014. Bolivian entrepreneurs see themselves as motivated by opportunity rather than necessity, and consider themselves to be 'local innovators'. Most early-stage entrepreneurs have modest growth expectations - expecting to create only five or fewer jobs in the next five years. It is interesting to note that the level of entrepreneurial activity tends to be higher among the university educated and those with only elementary education - but lower for those with high school education. Even though Bolivia is a world leader in microfinance, most early-stage entrepreneurial activity is still financed with personal savings due to the small amounts of investment required and daunting bank bureaucracy. The majority of startups are in the services sector, primarily commerce and hospitality. The average Bolivian entrepreneur is male, 25-34 years old, a high school graduate, and in business to pursue an opportunity rather than out of necessity. Any post-school business training he has received will be from a previous job. He has a low investment venture in the consumer services industry. He seeks financing from family savings in order to bootstrap his business. Several municipal efforts to develop creative shared spaces to foster venture creation (see below). Each year, the municipal government of La Paz holds a startup contest, with the winner and runner-up provided with a dedicated physical base and access to training services. It has been very effective in nurturing the entrepreneurial community and in helping early-stage entrepreneurs get the knowledge and tools required to develop their ideas and businesses. The last six years have seen a decline in opportunity-driven entrepreneurship due to strong GDP growth resulting from the natural resources boom. For entrepreneurship to thrive in Bolivia, there needs to be a concerted effort to develop policies and programs that foster innovative entrepreneurial initiatives. There is a particular need to tackle cultural impediments to entrepreneurship, ease access to financial support, help entrepreneurs take their products and services to new markets, and improve education and training. Policymakers should focus on tapping the pre-existing social capital potential through the creation and enhancement of shared creative spaces (co-working) to foster "high-end" entrepreneurial activity. The bureaucratic barriers to starting and closing a business need to be whittled down - this will smooth the way for the creation of new businesses, and allow entrepreneurs to get back on their feet after a business fails, learning from their mistakes. Finally, improving the overall level of economic stability will make starting-up seem less risky, and encourage new ventures. 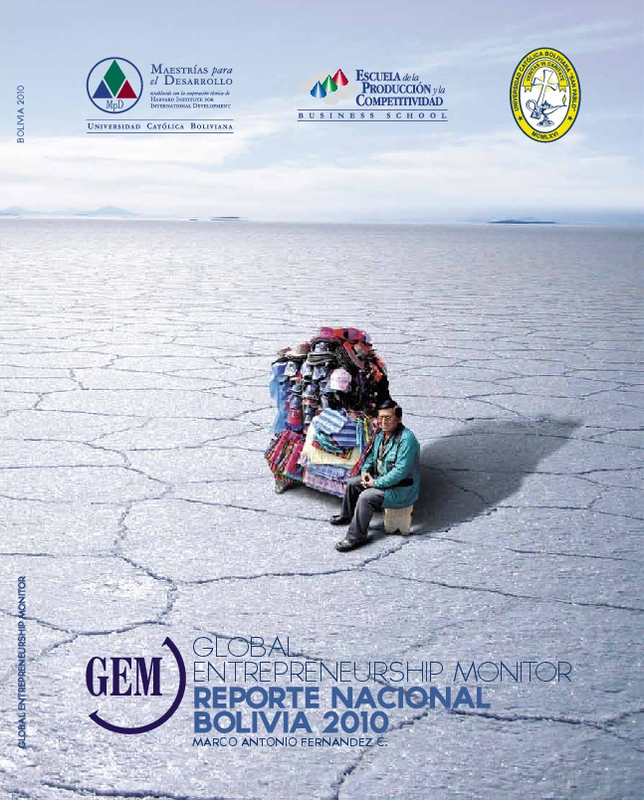 The GEM - Bolivian National Report 2014 describes the main findings of the GEM survey and includes a brief analysis of the Bolivian economy. The report also emphasizes three special topics: a) Education and capacity building, b) Entrepreneurs’ income and entrepreneurship financing and c) Entrepreneurs’ associativity and networking. 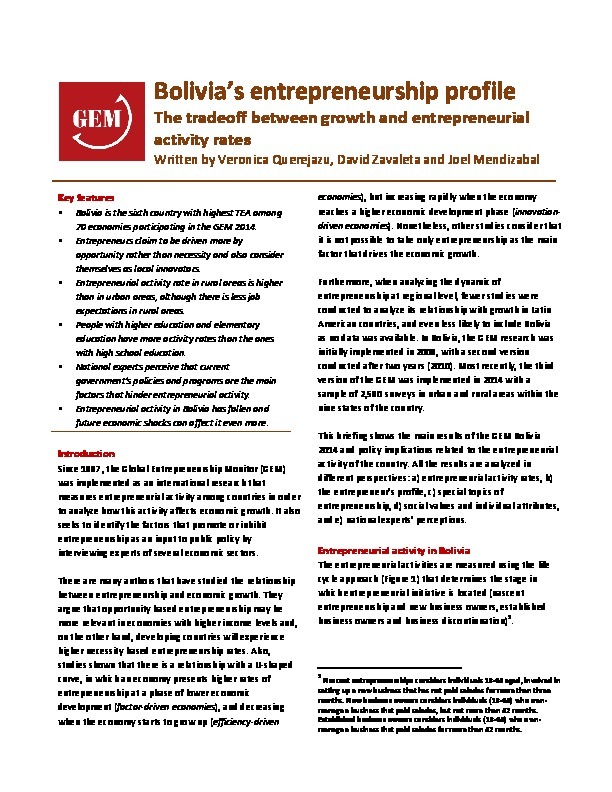 The tradeoff between growth and entrepreneurial activity rates in Bolivia. 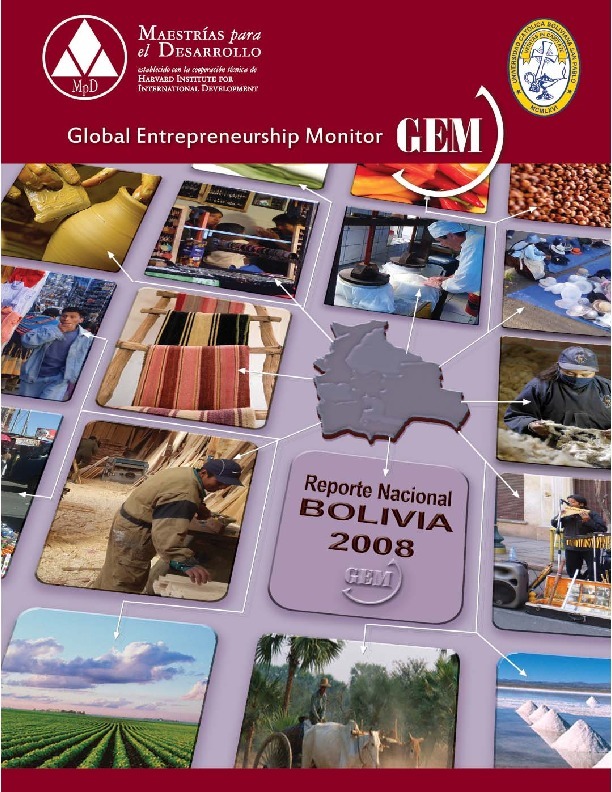 Key features a) Bolivia is the sixth country with highest TEA among 70 economies participating in the GEM 2014. b) Entrepreneurs claim to be driven more by opportunity rather than necessity and also consider themselves as local innovators. c) Entrepreneurial activity rate in rural areas is higher than in urban areas, although there is less job expectations in rural areas. d) People with higher education and elementary education have more activity rates than the ones with high school education. e) National experts perceive that current government’s policies and programs are the main factors that hinder entrepreneurial activity. f) Entrepreneurial activity in Bolivia has fallen and future economic shocks can affect it even more.